This week’s Perfume Pic of the Week is a double-whammy of the colour pink. As you may tell from the slight overuse of varying shades of the colour on this website, pink is one of my favourite colours and to me, evokes feelings of joy. After all, some of the best things in life are pink, such as; roses, macarons and Womanity, just to name a few. So this week I’m celebrating a duo of fuchsia fancies that bring brightness in a rather lovely composite image. 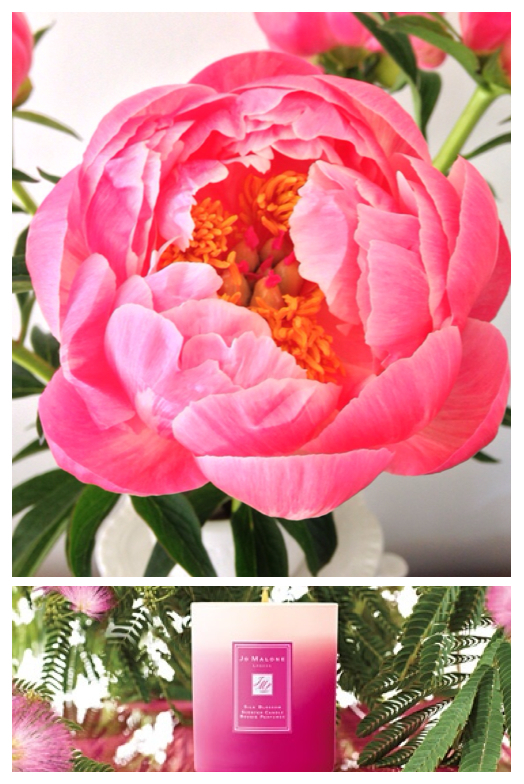 Peonies are the first subject of this mini ode to the colour pink, and what a beautiful topic they are. Nigel and I adore fresh flowers and the number of filled vases in our house definitely outweighs the space found in a one bedroom apartment. This weekend we picked up some beautiful, pink peonies (wonderfully ‘snapped’ by Nigel in the picture above) that are grabbing our attention with their huge, showy buds and softly sweet/spicy odour. I like the note of peony in perfume too, especially in Penhaligon’s rather marvellous Peoneve. What Peoneve does quite remarkably, is capture the sharp, peppery, spicy and rosy facets of the flower to create a perfume that presents the image of peonies in the ground with the petals and stems all present and correct, and surrounded by soft soil. Both the flowers and the perfume speak of a self-assured beauty that is both casual and striking.